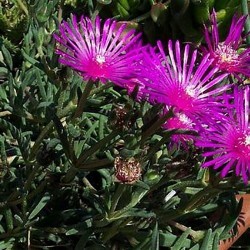 Delosperma There is 1 product. Landmark perennial groundcover evergreen succulent and fleshy. Daisies in bright pink purplish ligules june to september. Rockery, border, pot, planter. Soil drainage. Spray and resistant to drought.